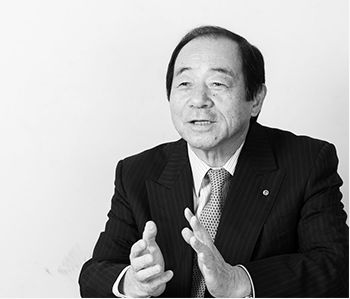 Starting in 1975 with the wholesale of seafood, Daiki Suisan opened supply routes throughout Japan and overseas and expanded its business by developing an original distribution system that delivers products to the consumer at producer level prices. 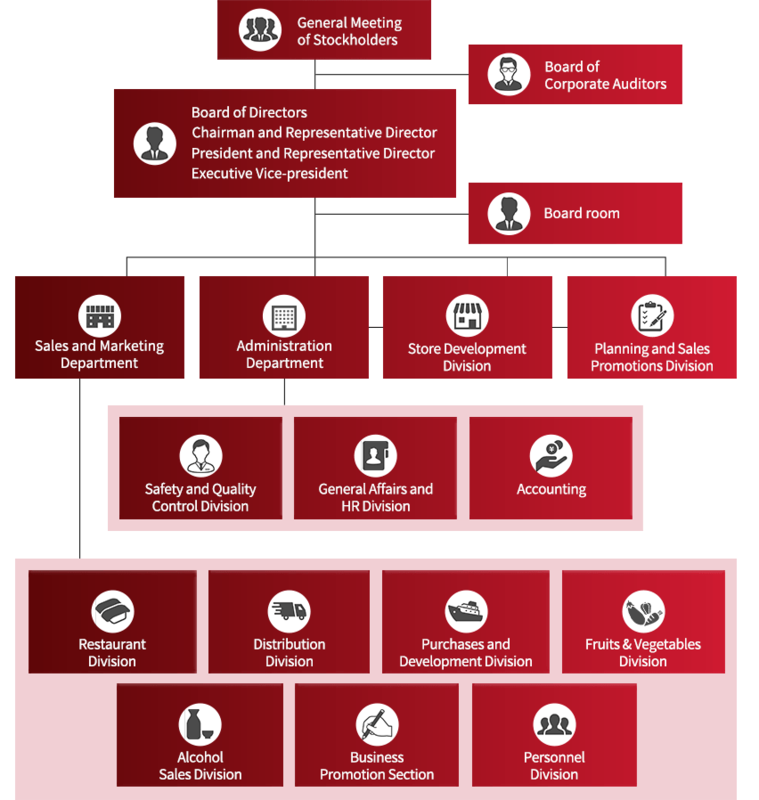 The operation of our directly-managed Machi-no-Minato (fresh fish markets) and expansion of our chain of kaiten (conveyor belt) sushi restaurants are supported by this in-house system. With “Freshness First” - the basis of all cuisine - as our corporate philosophy, we continue to pursue new business visions from Osaka, which has long served as “Tenka-no-Daidokoro” (the nation’s kitchen). This is done by providing people around the world with seafood shipped directly from Japan’s renowned fisheries as well as the freshest delicacies from the world’s ocean’s and delicious Japanese sake to match. Based on the theme of “Freshness First,” the Daiki Suisan Group is grateful for all of nature’s gifts and pursues the true value of food in order to help achieve a richer society. Operation of kaiten sushi restaurants and retail of side dishes and takeout sushi made from fresh fish directly shipped from fishing ports throughout Japan. With divisions for F&B and seafood retail, Daiki Suisan Co., Ltd. is the largest company for marine products in Kansai. In 2015, we opened 3 new branches in Osaka and the Kanto region and in the future, with an anticipated 2 billion yen in sales, will aim to increase our sales and profits by searching for locations in line with our brand concept and opening 3 additional branches each year. Further, we will actively seek opportunities to expand overseas in order to increase the scale of our business operations. 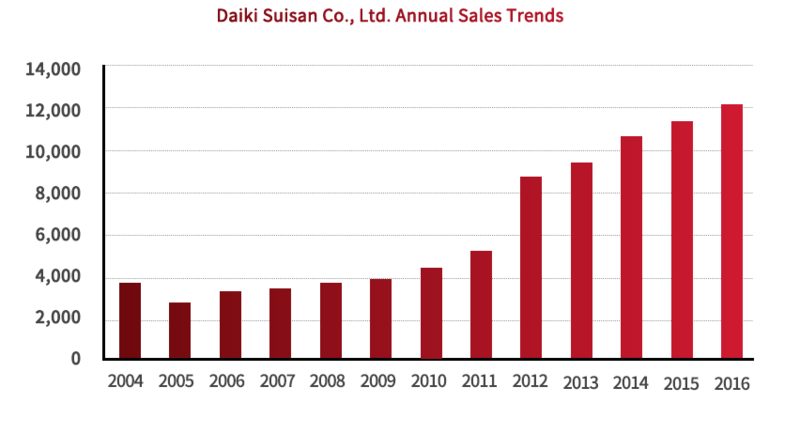 Established Daiki Suisan Co., Ltd. with operations centering on the wholesale of salted dried products within the Sakai Chuo Sogo Oroshiuri Market. Opened a wholesale store for seafood and began business within the Sakai Chuo Sogo Oroshiuri Market. Established Nambu Kikaku Kaihatsu Co., Ltd. Opened the “Sakai Ikeuo Ryutsu Center” along the Osaka Sakai Central Circular Route and expanded into retail. Began broadcasting at Radio Osaka on seafood market conditions to provide fresh and lively information to consumers (Shinsen Ikeike Jouhou) and simultaneously started direct shipments from producers in Sakaiminato, Tottori. Sakai Chuo Sogo Oroshiuri Market moved to Nakamura-cho, Sakai and the Sakai Ikeuo Ryutsu Center was opened on the same site. Opened the Osaka Tobu Ikeuo Ryutsu Center at Higashi Sumiyoshi-ku, Osaka. Opened the Daiki Suisan Queen’s Market (today “Nara Ikeuo Ryutsu Center) in Kashiwagi-cho, Nara as well as the natural fresh fish kaiten sushi restaurant “Daisukiya” on the same site. Remodeled and renamed the Moriguchi branch as “Toretore Sushi” and opened Japan’s first kaiten sushi restaurant located in a department store (today “Daiki Suisan Kaiten Sushi Restaurant Keihan Moriguchi Branch). Established Daisukiya Co., Ltd. (absorbed and consolidated by Daiki Suisan in 2011). Opened the Daiki Suisan Kaiten Sushi Restaurant Sakai Branch next to the Sakai Ikeuo Ryutsu Center. Opened the fresh fish retail area at Frest Neyagawa in Neyagawa, Osaka. Opened the large-scale gourmet kaiten sushi restaurant “Daiki Suisan Kaiten Sushi Restaurant Sakai Branch” within the Sakai Chuo Sogo Oroshiuri Market. Renewed and reopened the Daisukiya Nara Branch as the Daiki Suisan Kaiten Sushi Restaurant Nara Branch. Renewed and reopened the Sakai Ikeuo Ryutsu Center. Opened the Houryou Maru Kitanoda Restaurant within Bellhill Kitanoda in Sakai, Osaka. Opened a Daiki Suisan Kaiten Sushi Restaurant & International Fish Market within Rinku Pleasure Town Seacle in Izumisano, Osaka. Business operations for Daiki Suisan Kaiten Sushi Restaurant Kinokawa Branch in Hiraoka, Wakayama were transferred from Daisukiya Co., Ltd. to Daiki Suisan Co., Ltd. Opened the Daiki Suisan Kaiten Sushi Restaurant Nara Gakuenmae Branch in Naka Tomigaoka, Nara. Opened the Daiki Suisan Kaiten Sushi Restaurant & Machi-no-Minato Hyogo Kawanishi Branch in Kamo, Kawanishi, Hyogo. Opened the Daiki Suisan Kaiten Sushi Restaurant Abeno Q’s Mall Branch in Abeno-ku, Osaka. Absorbed and consolidated Daisukiya Co., Ltd. Increased capital to 90 million yen. Opened the Machi-no-Minato Shokudo Nara Branch as a food court next to the Machi-no-Minato Nara Branch. Opened the Daiki Suisan Kaiten Sushi Restaurant and Machi-no-Minato Minoh Branch in Minoh, Osaka. Opened the Daiki Suisan Kaiten Sushi Restaurant Kongo Branch in Sayama, Osaka. Opened the Daiki Suisan Kaiten Sushi Restaurant Whitey Umeda Branch in the Umeda underground in Komatsubara-cho, Kita-ku, Osaka. Opened the sashimi and sushi restaurant “Tenka-no-Daidokoro Daiki Suisan Seafood Restaurant Namba City Branch” on the 1st floor of the Namba City Main Building in Namba, Chuo-ku, Osaka. Opened the Machi-no-Minato Hankyu Sanbangai Branch on B2 of the Hankyu Sanbangai in Shibata, Kita-ku, Osaka. Opened the Tenka-no-Daidokoro Daiki Suisan Seafood Restaurant Sakai Branch within the Sakai Chuo Sogo Oroshiuri Market. Opened the Daiki Suisan Kaiten Sushi Restaurant Dotombori Branch at Dotombori, Chuo-ku, Osaka. Opened the Machi-no-Minato Yao Branch at Sonai-cho, Yao. Opened the Daiki Suisan Kaiten Sushi Restaurant Yao Branch at Sonai-cho, Yao. Opened the Machi-no-Minato and Tenka-no-Daidokoro Daiki Suisan (food court) Restaurant Kobuchi Branches on the 1st floor of the Itoyokado Kobuchi Store in Kobuchi, Minami-ku, Sagamihara, Kanagawa. Opened the Daiki Suisan Kaiten Sushi Restaurant Namba Walk Branch at Sennichimae, Chuo-ku, Osaka. Opened the Daiki Suisan Kaiten Sushi Restaurant Lalaport Ebina Branch at Ogi-cho, Ebina, Kanagawa. Opened the Daiki Suisan Kaiten Sushi Restaurant Lalaport Expocity Branch at Senri Banpakukoen, Suita, Osaka. Opened the Machi-no-Minato Kyoto Fushimi Branch at Shimotoba, Fushimi-ku, Kyoto. Opened the Daiki Suisan Kaiten Sushi Restaurant Kyoto Fushimi Branch at Shimotoba, Fushimi-ku, Kyoto. Opened the Daiki Suisan Kaiten Sushi Restaurant Kobe Uozaki Branch at Uozaki Nishi, Higashinada-ku, Kobe, Hyogo. Opened the Daiki Suisan Kaiten Sushi Restaurant Kobuchi Branch on the 1st floor of the Itoyokado Kobuchi Store in Kobuchi, Minami-ku, Sagamihara, Kanagawa. 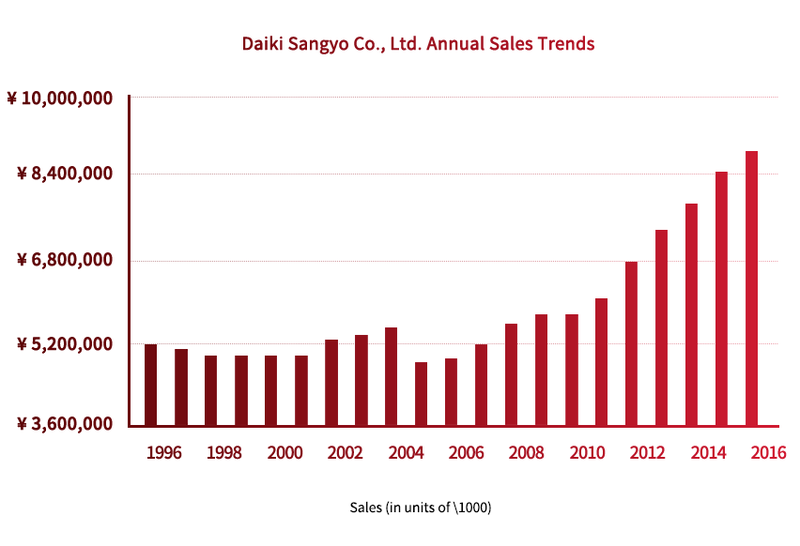 Daiki Sangyo Co., Ltd. single-handedly manages the product purchases of the Daiki Group and has established a distribution system offering both speed and freshness thanks to our strong partnership with our clients and the expansion of our sales network. As evidence of our customers' trust, our clientele includes major department stores and supermarkets in the Kansai region, further attesting our company's long record of achievements. We have also began trading with China and the nations of Southeast Asia, and always searching for new ways to pioneer the needs of the times, we will continue actively expanding these operations in the future. Established in Sakai, Osaka as a wholesaler specializing in processed tuna under the name “Daiki Food Co., Ltd.” (5 million yen in capital). 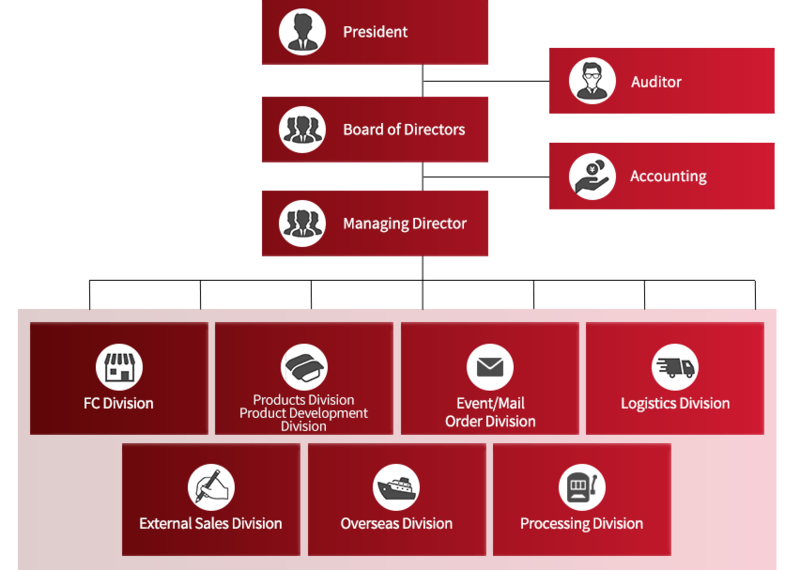 Expanded operations centering on its business with Daiki Suisan Co., Ltd.
Changed company name to Daiki Sangyo Co., Ltd. Increased capital to 50 million yen. Began business with The Keihan Department Store Hirakata Branch. Began business with Keihan Electric Railway Co., Ltd. Kyobashi Branch. Began business with The Keihan Department Store Moriguchi Branch. Began business with Hankyu Department Stores, Inc. Umeda Branch. Began business with Keihan Restaurant. Began business with Kyowa Reizo Co., Ltd.
Began business with Tobu Reizo Co., Ltd.
Began business with Keihan Electric Railway Co., Ltd. Makino Branch. Began business with Hankyu Foods Inc.
Began business with Keihan Electric Railway Co., Ltd. Frest Matsuiyamate Branch. Began business with Keihan The Store Co., Ltd. Korien Branch. Began business with Seiyo Food Systems, Inc.
Began business with Balnibarbi Co., Ltd.
Began business with Daisukiya Co., Ltd.
Began business with Keihan The Store Co., Ltd. Frest Neyagawa Branch. Began business with Keihan The Store Co., Ltd. Fujisaka, Makino and Koyo Branches. Began business with Shinsenkaku Kuzuha Branch. Began business with Daisukiya Co., Ltd Temmabashi Branch. Began business with Daisukiya Co., Ltd Korien Branch. Began business with Daisukiya Co., Ltd Keihan Kyobashi Branch. Began business with Seafood Hokuriku (Sogo Kobe and Tokushima Branches). Began business with Daiki Suisan Co., Ltd. Kaiten Sushi Restaurant Sakai Branch. Began business with Daiki Suisan Co., Ltd. Kaiten Sushi Restaurant Nara Branch. Began business with Daisukiya Co., Ltd. Kaiten Sushi Restaurant Kishiwada Branch. Began business with Keihan The Store Co., Ltd. Frest Owada Branch. Began business with Keihan The Store Co., Ltd. Frest Komagawa Branch. Began business with Daiki Suisan Co., Ltd. Kaiten Sushi Restaurant Rinku Seacle Branch. Began business with Daiki Suisan Co., Ltd. International Fish Market Rinku Seacle Branch. Began business with Daisukiya Co., Ltd. Kaiten Sushi Restaurant Kinokawa Branch. Began business with Daisukiya Co., Ltd. Kaiten Sushi Restaurant Nishinomiya Gardens’ Branch. Began business with Daisui Co., Ltd. (Hankyu Oasis). Began business with Daiki Suisan Co., Ltd. Kaiten Sushi Restaurant Nara Gakuenmae Branch. Began business with Daiki Suisan Co., Ltd. Kaiten Sushi Restaurant Hyogo Kawanishi Branch. Began business with Daiki Suisan Co., Ltd. Machi-no-Minato Hyogo Kawanishi Branch. Began business with Daiki Suisan Co., Ltd. Kaiten Sushi Restaurant Abeno Q’s Mall Branch. Began business with Daiki Suisan Co., Ltd. Machi-no-Minato Shokudo Restaurant Nara Branch. Began business with Daiki Suisan Co., Ltd. Kaiten Sushi Restaurant Minoh Branch. Began business with Daiki Suisan Co., Ltd. Machi-no-Minato Minoh Branch. Began business with Daiki Suisan Co., Ltd. Kaiten Sushi Restaurant Kongo Branch. Began business with Daiki Suisan Co., Ltd. Kaiten Sushi Restaurant Whitey Umeda Branch. Began business with Daiki Suisan Co., Ltd. Tenka-no-Daidokoro Daiki Suisan Seafood Restaurant Namba City Branch. Began business with Daiki Suisan Co., Ltd. Machi-no-Minato Hankyu Sanbangai Branch. Began business with Daiki Suisan Co., Ltd. Tenka-no-Daidokoro Daiki Suisan Seafood Restaurant Sakai Branch. Began business with Daiki Suisan Co., Ltd. Kaiten Sushi Restaurant Dotombori Branch. Began business with Daiki Suisan Co., Ltd. Machi-no-Minato Yao Branch. Began business with Daiki Suisan Co., Ltd. Kaiten Sushi Restaurant Yao Branch. Began business with Daiki Suisan Co., Ltd. Machi-no-Minato Kobuchi Branch. Began business with Daiki Suisan Co., Ltd. Kaiten Sushi Restaurant Kobuchi Branch. Began business with Daiki Suisan Co., Ltd. Kaiten Sushi Restaurant Namba Walk Branch. Began business with Daiki Suisan Co., Ltd. Machi-no-Minato Kyoto Fushimi Branch. Began business with Daiki Suisan Co., Ltd. Kaiten Sushi Restaurant Kyoto Fushimi Branch. Began business with Daiki Suisan Co., Ltd. Kaiten Sushi Restaurant Kobe Uozaki Branch.